The change is part of a state-wide trend away from coal over the last decade. Amy Jahns is a spokesperson for WEC Energy Group, which owns the Presque Isle plant. She says the utilities in the U.P. couldn’t provide enough reliable electricity to customers, including their coal plant. "So a few years ago the U.P. was having issues with reliability," Jahns says. "And as part of an agreement with then Governor Rick Snyder and many other entities in the state, we came up with a long-term energy solution that was cost-effective and good for the environment." In March, the company started switching from coal to natural gas. She says natural gas will be more reliable, because its facilities can be expanded and add more megawatts if needed. Janhs says the new gas plants cost $275 million to build. She says half of that will be paid by a Cleveland company operates a mine near Marquette, while the other half will be recouped with customer utility bills. Jahns says the new plants will save customers and the company $600 million over the next 30 years and cut emissions. She says 85 employees have lost their jobs with the closing of the plant. "We have been working with a company called Michigan Works to assist those employees that will be affected by the closure," Jahns says. Bridge Magazine estimates 15 coal-powered plants have closed in Michigan since 2010, and six more are expected to shut down within the next six years. 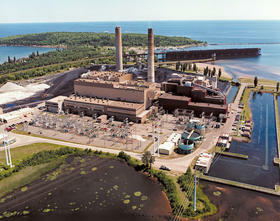 The Neenah Paper Munising Mill Power Plant is the final coal-fired power plant in the U.P. It just powers its own operations and does not provide power to customers. Copyright 2019 Interlochen Public Radio. To see more, visit Interlochen Public Radio.